Tryouts for the Indy Red semi-pro women’s team. Photo: Indy Red. With the turn of a new year came a new era in ultimate. Semi-professional1 women’s teams popped up throughout the Midwest, led by Detroit and Nashville. In Indianapolis, the road to pro women’s ultimate has been filled with twists and turns. As pioneers for women’s ultimate in the local community, Jackie Lai and Lauren Piontek embarked on a mission to create a women’s team of their own. Quickly, they forged a partnership with the Indianapolis Alleycats, only to see it dissolve before it ever began. Indy Red, Indianapolis’ professional women’s team, began as the brainchild of co-founder and captain Lauren Piontek. Just hours after the Detroit Mechanix announced the promotion of their women’s team, Piontek, along with co-founder Jackie Lai, planted the seedlings of a plan that would bring a professional women’s ultimate team to Indianapolis. “[Lauren] messaged me a couple hours after the Detroit Mechanix released their public statement. I was immediately on board,” said Lai. They met the next day and never looked back. 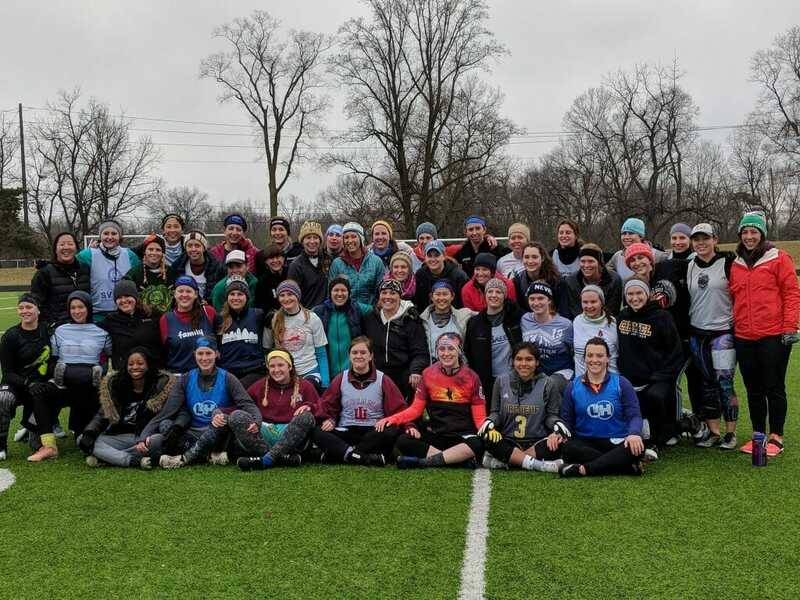 Within just a couple of days, Lai and Piontek had set up plans to host the first round of tryouts for the inaugural Indianapolis women’s professional ultimate team. 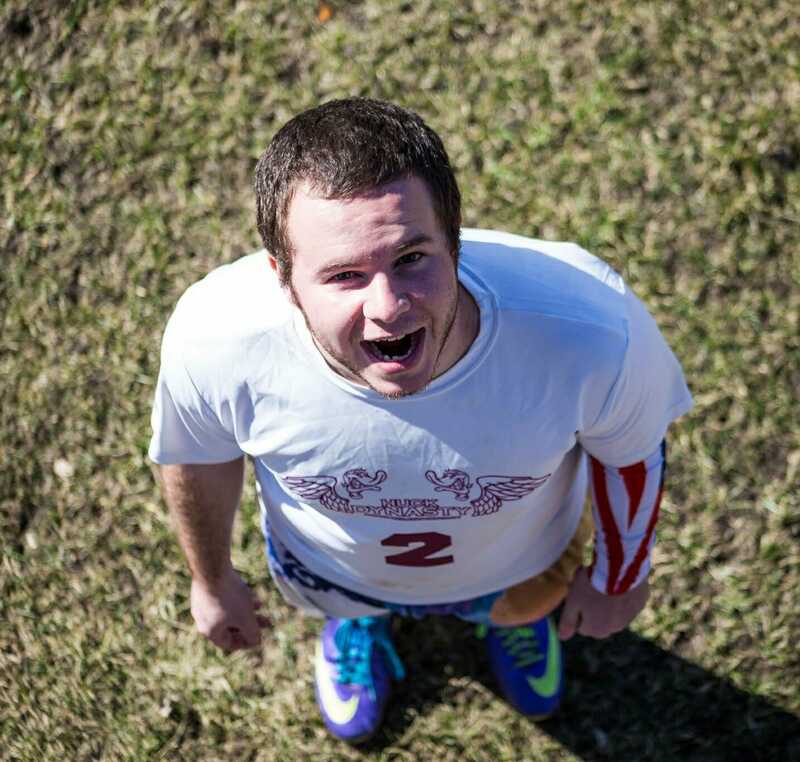 With the assistance of some local community members along with Indiana Wesleyan Ultimate, Indy Red had found discounted field space to run an initial tryout. Indianapolis Alleycats head coach Eric Leonard and general manager Tyler Stapleton agreed to attend the first round of tryouts and help as a talent scout. With backing from the community, a strong response for tryouts, and support and sponsorship from the Indiana Ultimate Foundation, the Indy Red organization was well under way. Just days before the initial Indy Red tryout on February 5, the Indianapolis Alleycats announced a partnership with, at the time, Alleycats Red as an affiliate women’s team. This announcement took the Indianapolis ultimate community by storm. With plans in place, it seemed as though the Indianapolis Alleycats were fully on-board to help with the creation of the team. In fact, the Alleycats had already worked to schedule a showcase game between Indianapolis Red and Nashville Nightshade, the women’s affiliate of the Nightwatch, and were in the process of finalizing details to bring at least one women’s game to Indianapolis as a showcase. With Lai and Piontek creating the basic structure of a separate organization for the team on their own, there were also plans for additional games against the Detroit women’s team. Going forward, any partnership between the Indianapolis Alleycats and Indy Red would be a joint effort between two separate entities. “The initial agreement between Indy Red and the Indianapolis Alleycats was more about the mutual benefits that the two organizations could reap by being affiliates,” Stapleton said. With this agreement, though, Red would still be responsible for providing their own gear for the season, providing merchandise for sales, and even providing referees for their home games. Even with the partnership in place, the Indianapolis Alleycats knew that they would not be able to afford to cover the costs of travel for Indy Red. Negotiations began when Indy Red they decided they would need financial help in this endeavor. In order to recoup costs for travel, jerseys, and field space, Piontek and Lai negotiated for the women’s team to receive 50 percent of the ticket sales for the (originally) unplanned home game against the Detroit women’s team. With all of these basic tenets agreed upon, Lai and Piontek sought to get official confirmation of this deal in writing. Alleycats owner Tim Held, however, said that he didn’t want to get lawyers or contracts involved in the dealings. Willing to meet in the middle, Piontek and Lai decided they wanted to write up a simple memorandum of understanding (MOU) to have a written commitment for what the season would look like. Perhaps it was an omen that the initial announcement of Alleycats Red by the Indianapolis Alleycats organization came before any official agreement was in place. In many ways, a true partnership was never set. Rather, it was a very loose verbal agreement. With tryouts over and season planning deeply underway, Piontek, Lai, and John Rempel, President of the Indiana Ultimate Foundation, sought to make official the agreement with the Indianapolis Alleycats. It was during a conference call at an Indiana Ultimate Foundation meeting that the decision was made for IUF to fully fund Indy Red and to separate from the Alleycats. Two major obstacles stood in the way of creating a partnership. “The first red flag that popped up was notification from JR and some members of the IUF Board that Tim expected a 15% licensing fee be paid to the AlleyCats for any AlleyCats Red merchandise that we sold,” Lai said. What started as a disagreement about jersey sales helped solidify that the two parties were far from an agreement. Held was requesting a licensing fee on all Indy Red merchandise sold. The licensing fee would give the Alleycats organization 15 percent of the retail price on every jersey sold, both online and at Alleycats home games. With that fee in place, on top of a more expensive base price of gear, fan jerseys purchased would have cost in excess of $75 per jersey to make margins that made it possible to repay sponsors. In addition to the dispute on jersey sales, there was also a conflict around ticket sales. With the initial verbal agreement, it seemed as though Indy Red would receive an even split in ticket sales at the Indy Red home game against Detroit. This new offer meant that Indy Red would only be able to receive revenue from online sales that Indy Red players directly sold, and that no money would be generated for Indy Red from sales at the gate. Such a stipulation would drastically reduce the opportunity for the Indianapolis women’s team to fundraise and repay their primary sponsors. “The true 50-50 split we sought against Detroit was about us being fifty percent of the product,” Lai said. Piontek, Lai, and the IUF delivered a proposed MOU to the Alleycats with the hopes of reaching an agreement with the Alleycats. This proved to be the breaking point between the organizations. After some back and forth between the leaders, it became clear there would be no agreement. Held was not willing to move toward a 50-50 split on ticket sales, nor was he willing to relinquish the licensing fee he sought to charge on Red merchandise. Held said that he offered generous terms for a split of ticket sales generated by the Red organization, structured similarly to a previous arrangement the Alleycats had with the Indy Eleven, a local North American Soccer League team, but with more upside for Red. “I agreed to share our platform, resources and knowledge to host two friendly games and have never wavered on our commitment,” he said. Joey Cari, a member of both the Alleycats and the IUF board, has been uniquely involved in the discussions between the two organizations. He feels that an unbiased viewpoint has been lacking. On the IUF board, there is one Alleycats player; one coach of Indianapolis Women’s club team, Rogue; and three members of Indy Red. Of those, Joey has been the sole member to abstain from voting. With a number of things sitting in the way, Indy Red made the decision to pull away from the Indianapolis Alleycats, in effect becoming fully their own organization sponsored by the IUF. As a result of the breakup between Red and the Alleycats, the IUF has withdrawn some of its support of the Alleycats organization. Although IUF has never given direct financial support to the Alleycats, the organization has chosen to advertise and support the broadcasts of the team. Now, Indy Red finds themselves as a community backed women’s team. They will continue on throughout the remainder of 2018, as they originally hoped, with plans to play both home and away games against the teams from Nashville and Detroit. In the time since the partnership dissolved, Held has been relatively quiet within the community, responding little to public questioning. Simply put, Held has seen the fallout between Indy Red and the Alleycats as a disagreement about business, and nothing more. In his mind, the decision never came down to values, but simply money and preparation. The fact that the season just over six weeks away from beginning only added more pressure to Held and the Alleycats leadership. With just a few weeks to put plans in place, the Alleycats were pressed against a timeline to make a decision on the partnership. Just weeks after the fallout between the Alleycats and Indy Red, GM Tyler Stapleton announced his resignation last week. This ended his four-month stint as GM; he left before the season even started. Throughout the course of Indy Red’s development, Stapleton was a supporter. He helped out at tryouts. In the background, he lobbied to the community for support on his personal social media pages and sought additional ways to help the team. When it came down to negotiations, Stapleton worked to create a fair deal. “Tyler Stapleton has been our biggest ally throughout the entire process,” Lai said. “He negotiated for us, supported our every move, and even stood out in the cold for three hours to be able to help us as much as possible. Tyler truly believes in true and fair promotion of women in ultimate and fought for us as much as he could. With the disintegration of the partnership came the end of Stapleton’s time as GM. Throughout the course of Indy Red’s first weeks as a program, the team has seen tremendous support from the local community. In addition to huge financial support and backing by IUF promised throughout the season, community members and personal friends have reached out offering support. As Indy Red moves throughout their first season, the Indianapolis ultimate community will have their eyes on this team. Indy Red is still in the process of confirming the dates of their schedule for their inaugural season. Comments on "Inside The Breakup Of Indy Alleycats, Indy Red Women’s Team"